David and Goliath? Nikon D4 dwarfs NEX-7! Side by side on my light table (which collapses with a ‘pop’ when sixteen tons of Nikon is placed on it), and the NEX-7 is given the foreground role to avoid any accusations of using perspective to make it look tiddly. I’m writing some reviews of the Nikon and other new professional DSLRs for the British Journal, so I won’t say anything about the Nikon’s rather wonderful 16 megapixel full frame sensor or its stunning low light performance. I hope when Nikon read my reports they’ll decide to send me to photograph in the Arctic Circle in December – there would be plenty of light for this beast. This picture won’t be going to the BJP. I like it because these are equivalents. The Nikon’s 28-300mm VR is admittedly f/5.6 at the long end (and a vast amount better than any Sigma or Tamron 28-300mm or 18-200mm yet made). But otherwise, these are zooms with the same range of angle, both stabilised, both very quiet in both focusing and IS action, both very well-made. And the cameras are both a real pleasure to use and produce 100% professional results. The difference is that if I stick the NEX-7 combo under my coat, I do not look like a shoplifter or terrorist with a concealed weapon of mass-perturbation. Watch out for our NEX-7 review soon. I’m not hurrying and it may be a month or more. 1 comment to David and Goliath? 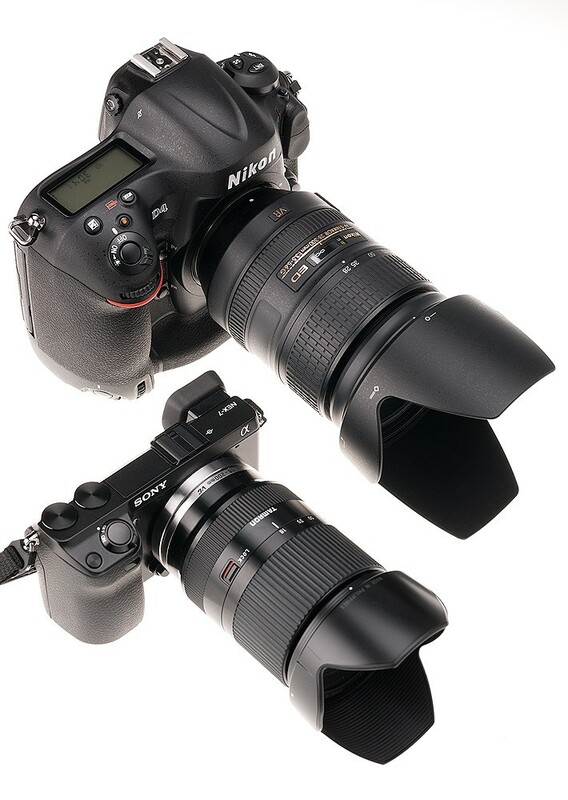 Nikon D4 dwarfs NEX-7!